1Lt Robert L. Phelps, Jr (P) - Fourteen CoPilot missions - 15 May through 17 Aug 1943: 1Lt James S. Nix (P) - 9 missions (36, 41, 43, 47, 48, 51(A), 52, 56, 60; 1Lt Arthur H. Pentz - 3 missions (40, 42, 49); Other pilots - 2 missions (37, 44). Upgraded from CoPilot to Pilot on orders dates 30 July 1943. Dispatched on 13 missions (11 credited) from 24 Aug through 14 Oct 1943. Twenty-five mission combat tour completed on the Second Schweinfurt mission on 14 October 1944. F/O Harold S. Bolsover (CP) - Dispatched on twelve missions as the Lt Phelps CoPilot (63, 65, 66, 67, 70, 71(A), 72(AS), 73, 74, 75, 76(A), 78). Substitute CoPilot used on mission 77. Other Bolsover missions: Five with Lt Guy H. McClung (P) - (42 - As Bombardier), 49, 51, 54, 55 - As CoPilot); Two as a lead crew Tail Gunner/Observer (52, 57); Upgraded from CoPilot to Pilot on orders dated 16 October 1943 and promoted from F/O to 2ndLt. Flew seven missions as 1st Pilot (82, 83, 91, 92, 93(A), 95, 97) and three as a lead crew CoPilot (88, 90, 94). F/O Bolsover's 25 mission combat tour completed on 7 Jan 1944. 2Lt Lloyd C. Johnson (N) - 2Lt Johnson dispatched on 10 missions with 1Lt Phelps (65, 66, 67, 71(A), 72(AS), 73, 74, 75, 76(A), 77, 78. Substitute Navigators used on two missions (63, 70). Other 2Lt Johnson missions: Nine with six different Pilots (42, 49, 51, 52, 54, 55, 57, 63, 70); One with 2Lt Harold S. Bolsover (P) - #82; Two with other Pilots (77, 83). Last mission - #83 on 26 Nov 1943 to Bremen, Germany as the PFF Lead Navigator, in 482nd BG(H) PFF B-17 #42-3484, B/G Robert F. Travis (Air Commander) and Capt Jacob James (P). Was mortally wounded and died on 2 Dec 1943. Is buried in the Cambridge, England American Cemetery. 1Lt Leroy V. Gordon (B) - Flew on five missions with Lt Phelps (63, 65, 66, 67, 70, 71). Replaced by 1Lt Theodore I. Rothman who was dispatched on the Lt Phelps last eight missions (71(A), 72(AS), 73, 74, 75, 76(A), 77, 78). 1Lt Gordon's 25 mission combat tour completed on 16 Sept 1943. T/Sgt Arnold S. Doran (E) - Flew on 3 missions with Lt Phelps as Pilot (63, 65, 66). Lt Phelps crew used substitute Engineers on ten missions: S/Sgt Lloyd L. Jordan - (67) and S/Sgt Marvin F. Powell (70, 71(A), 72(AS), 73, 74, 75, 76(A), 77, 78). T/Sgt Doran was previously dispatched on five missions with the Lt Nix (P)/Lt Phelps (CP) crew - 48, 51(A), 52, 56, 60). T/Sgt Doran's 25 mission combat tour completed on 3 Sept 1943. T/Sgt Paul P. McGee (R) - Dispatched on nine missions with Lt Phelps crew (63, 65, 66, 67, 70, 71(A), 72(AS), 73, 74). Previously flew on three missions with the Lt Nix (P)/Lt Phelps (CP) crew (52, 56, 60). T/Sgt Mcgee's 25 mission combat tour completed on 4 Oct 1943. T/Sgt Joseph Kerr (WG) - Flew on four missions with the Lt Phelps crew (63, 65, 66, 67). Previously flew on four missions with the Lt Nix (P)/Lt Phelps (CP) crew (51(A), 52, 56, 60). T/Sgt Kerr's 25 mission combat tour completed on 6 Sept 1943. Lt Phelps used a substitute Waist Gunner on the crews final nine missions - S/Sgt Joseph E. Robichaud (70, 71(A), 72(AS), 73, 74, 75, 76(A), 77, 78). T/Sgt Lloyd L. Jordan (WG) - Flew on three missions with the Lt Phelps crew (63, 65, 66). Previously flew on four missions with the Lt Nix (P)/Lt Phelps (CP) crew (51(A), 52, 56, 60). These missions flown as the Top Turret Gunner. T/Sgt Jordan's 25 mission combat tour completed on 6 Sept 1943. Lt Phelps used a substitute Top Turret Gunner, Sgt Charles W. Robb, on the crew's final ten missions (67, 70, 71(A), 72(AS), 73, 74, 76(A), 77, 78). 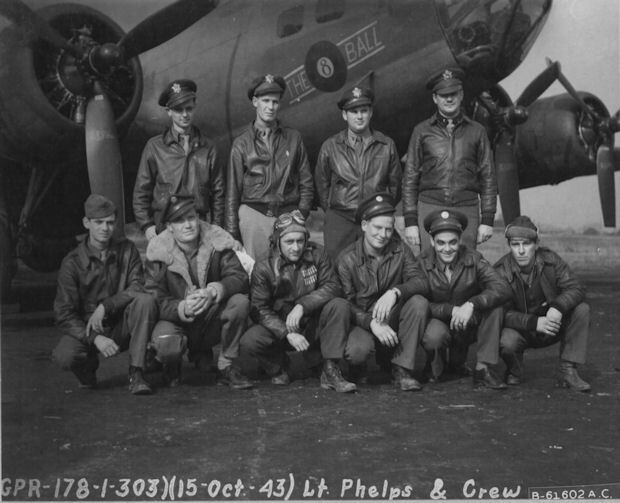 T/Sgt Jack L. Perryman (TG) - Dispatched on all thirteen Lt Phelps crew missions. Completed 25 mission combat tour on 26 Nov 1943.